Blade Material: Stainless Steel AUS 8. Hardness HRC 58-59. Blade Edge: Partially serrated, tanto tip. 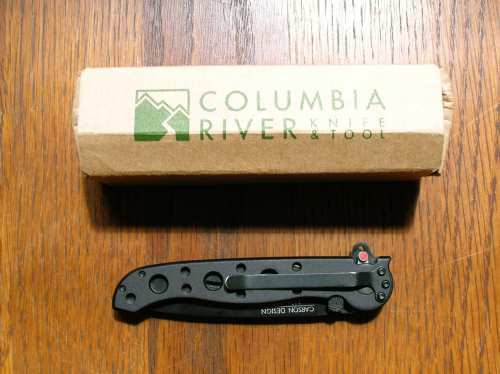 Full warranty information is available at the Columbia River Knife & Tool website and is included with every knife. CRKT states the "warranty covers any defects in materials or workmanship" and "if one of our knives ever breaks or fails because of material or manufacturing defect, we'll replace the knife." Like all warranties, the CRKT warranty does not cover abuse or misuse of their tools. 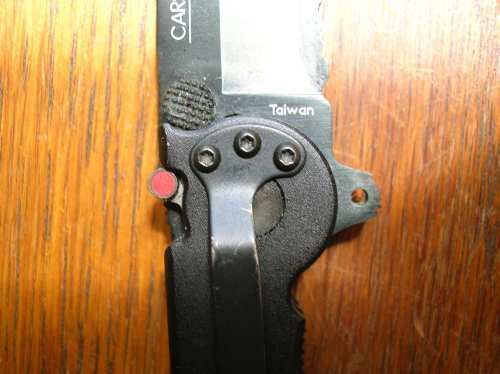 CRKT offers free replacement parts for missing parts which, on my particular knife, include frame and clip screws, the pivot screws, washers, thumb stud, the clip, and the AutoLAWKS mechanism. The M160-10K knife from CRKT is an everyday use, compact and lightweight knife. The knife itself comes in at 4 in (10.2 cm) when closed and weighs in at right just over 2 oz (60 g). My particular model is a partially serrated blade with a tanto tip, with many other styles available. The overall blade cutting surface is 3.125 in (7.94 cm), broken down into a 1 in (2.54 cm) serrated edge, 1.5 in (3.81 cm) standard edge, and a .625 in (1.59 cm) standard edge tanto tip. The blade locking system is CRKT's AutoLAWKS, a dual-locking system designed to eliminate accidental closure. My model also has a feature called the "Carson Flipper" which is essentially a dual purpose thumb stud. When open, the thumb stud serves as a blade guard for my fingers. When closed, it allows me to flip the knife open with one hand. AutoLAWK Switch and "Carson Flipper"
My first impression of this knife came well before I ever owned it myself. I was out kayaking with a friend of mine when he became tangled in a fishing line that had been carelessly abandoned which became stuck on some mangrove trees. He was able to quickly grab his knife that was conveniently clipped to his life vest and with one hand flipped it open and cut himself free. The ability to in one lightning quick motion open and lock this blade in place had my attention from the beginning. 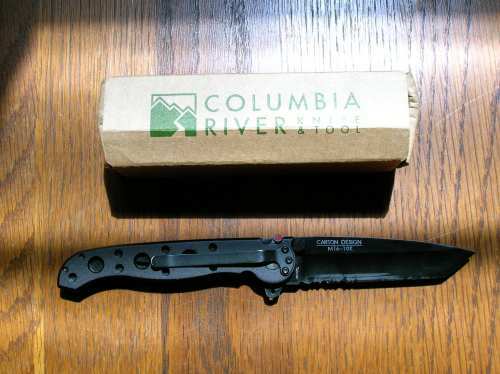 I placed an order for my own the very next day, knowing full well this blade could save my life. When I was able to spend some time having a good look at this knife, I was able to take in all its available features. The contoured aluminum grip fits comfortably in my hand both opened and closed. When open, the flipper keeps my index finger securely in place, and keeps it from venturing onto the blade surface. The backside of the blade has ridges that give my thumb a firm grip, allowing me to apply pressure without changing the way I am holding the knife. All these factors come together to form a virtually no-slip grip that gives me complete control over the blade in any direction. One of the most important features on any knife is its locking system. Far too many people have scars on their finger that can attest to the importance of a high quality and easy to use blade-locking system, and the AutoLAWKS offered on this model meets that requirement in every way. The AutoLAWKS engages itself whenever the blade is fully extended. It is a dual-locking system that requires me to both retract a small lever near the top of the handle (near the base of the blade) and then operate the blade lock itself which is an in-handle locking bar that slides into place when the knife is extended. All these features combine to fix the blade securely in place when open, virtually eliminating the possibility of accidental closure when being used. The other fabulous feature about this knife is the one-handed operation. Going back to my first impression, it is perhaps the primary reason that I first purchased the knife. With little more than 5 minutes practice, I was able to open and close this knife with one hand both quickly and safely. The ability to operate the knife with one hand makes it a pleasure to use. The M16-10K was designed by CRKT as a more compact version of the original M16 where the common complaint was that the M16 was too large for everyday use. The M16-10K fits and clips easily and comfortably into a hip or rear pocket without being too bulky. The combination of design and the materials used has produced a very light and well balanced knife, coming in at a little over 2 ounces (60 g). I consider it to be a lot of knife for such a small frame. I have one minor complaint concerning the clip on the handle, however. The clip itself is perfect for clipping it inside my pocket or onto a strap or webbing on my pack, but it is a little small for clipping it onto my belt. My concern would be whether the clip would bend over time if it was clipped to a thicker belt. Of course, part of the CRKT warranty provides free replacement clips and screws which would cover this if that ever did happen. The 3 small screws that keep the clip secured to the handle also come a little loose over time, but a T4 screwdriver can tighten them right back up. My only complaint with the blade is that the multiple surfaces present a tedious challenge when sharpening. The M16-10K is a single sharp edge blade, so sharpening is done only to one side of the blade. While taking the time to separately sharpen all 3 sections of the blade is not necessarily difficult, I am a person without a great deal of patience and would prefer to run it through my hand sharpener for a few swipes and just be done with it. Of course this is impossible, and it's required a lot of practice with a hand-sharpening stone to get it right. That being said, it is nice to be able to sharpen the different portions of the blade to varying degrees. For example, I keep the tanto version of the blade razor sharp and sharpen it the most often - since it is of course the portion of the blade I use the most often and I use it for the more "precision" tasks. It would probably be easier to list the things that I don't use this knife for, since I use it for virtually anything. The partially serrated tanto style blade makes it extremely versatile and I have yet to find a typical job that it hasn't been able to handle. It's safe to say that it is completely capable of being a daily-use knife. I've used it at work for things like opening up the shipments we receive. I use the tanto tip to zip right through all the sealed tape and get down to business and the serrated edge helps me cut right through any cardboard to get the boxes broken down. The tanto tip again comes in handy for those car camping trips with the family where somebody springs for steaks and then forgets a knife to carve with. On the trail, I've used it for things such as preparing my food, whittling out tinder for a fire, cutting shock cord for camp setup, cutting out moleskin patches for blisters, and even trimming fabric swatches for tent repairs. Unfortunately, I've also had to use the knife to cut clean through a climbing rope - but it is worth mentioning that the serrated portion took care of that in no-time. Conditions seem to have little effect on the performance of this knife. It has only seen trail-use in Florida so far, which means plenty of hot and rainy conditions - but in the more mild nights down into the 40's Fahrenheit (4-10 deg Celsius) there has been no noticeable change in performance or ease of use. After everything I've put the blade through, I am very happy with the durability and condition of the knife. The blade has no noticeable dings or nicks on the cutting surface and holds an edge very well. The black coating on the blade has scratched in a few places thanks to some of the heavier jobs, and the clip has had a minor bit of the paint come off the edges - but even cosmetically the knife is holding up quite well. As I mentioned previously, the 3 screws that hold the clip to the frame work themselves a bit loose over time. As part of my pre-trek check I always tighten them up. During my everyday usage of the knife I would say I snug up the clip screws about every other month. Also, I should add I have never had to tighten the frame screws or the pivot screw. The CRKT (lovingly nicknamed by owners as "Cricket") M16-10K is a well built and versatile knife that has been able to handle all the tasks that I've thrown at it to date. The innovative design and features along with its lightweight and durable materials combine to offer a knife that has found a permanent place at my side no matter what the job may be. 1. Extremely quick and easy to open, close, and operate this knife with one hand. 2. The AutoLAWKS system to secure the blade in place when opened. 3. The comfort while using it. 4. Excellent warranty and high quality materials and construction. 1. The knife is a little pricey. 2. Sharpening with the blade with its 3 seperate cutting edges takes some time and practice.